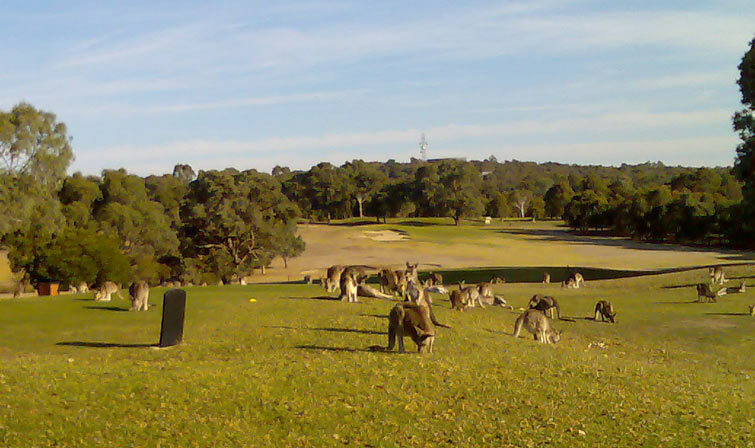 I don't mind kangaroo's in shopping centres, freeways and such, but having them on a golf course is going too far. 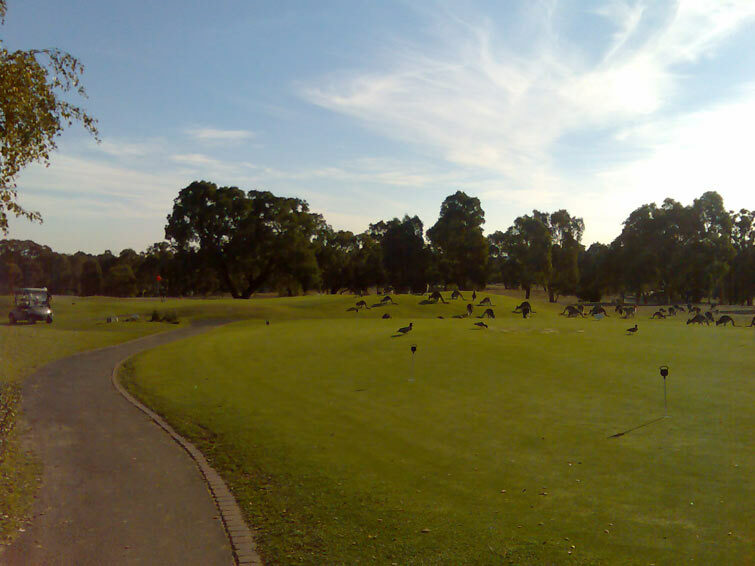 This is the first tee, and sure the baby ones are cute, but spook these ones and it would be like a Jurassic park mass migration? Witch in itself doesn't matter but if they head towards the busy road, on the left, then it might, (but l did see another one, jump in front of me on the road previously this day, so they may realize the danger) (the previous one jumped a good 2, 3 metres onto a bitchimen road in front of my car, so they can handle heights. These were the ones behind me at the putting green, so l had to keep watching my back. And the ducks look pretty menacing as well, lol. I believe Kay it is Four, as in, (without checking) losing 4 strokes, for a bad shot. Is that why Fourplay only takes four strokes? And then your ball goes in the hole? A friend wants to know. I'm just the messenger. I was at a conference once when a lady introduced herself by saying "I am a psychic pet massage therapist". And I started to say "Do you mean...?" And my friend, standing on the other side of me, stopped me by pulling on my elbow...whispering "Let it go, Claude. It's funnier if you don't say anything". And he was right. It was funnier. Probably the only time I followed that advice. Your willpower is stronger than mine. I'd have to ask if she was a pet massage therapist who was psychic, or whether she was a massage therapist for psychic pets. And just what sort of conferences do you attend? My mind went straight to that question. How do you get invites to all the unstuffy conferences? I had a compulsion to ask questions like that. My need to ridicule the absurd was almost overpowering. This specific conference, I think I paid $1,500 to attend. It was a Dan Kennedy marketing conference. It attracted all types of marketers. An interesting thing to me was what these diverse groups had in common. In a conference of 1,000 marketers, maybe 98% were conservative....but there were plenty of "New Age" types as well. A few Astrologers, Several palm readers. Several "Get Rich" Gurus.....In fact, maybe 10% of the attendees were paying just to be there to pitch everyone else. A lot of "Life coaches". That kind of thing. It was very difficult for me to keep a straight face while they told me about their "Vibrational Synchronicity" or some other blather. And most there really "Drank the Kool Aid". Dan Kennedy was giving a speech, and he said "Be the wizard. But beware the wizard". And I leaned over to the woman sitting next to me and said "...says the wizard". She looked at me like I was insane. In an audience of 1,500....the speakers (including the event producer who was always a speaker too) they might take in two million dollars over a 4 day event. That's something to watch and study. I kept two sets of notes with every speaker. One notebook was full of the information taught. The other one (the more important one) described how each speaker pitched their offer. It's how I learned to be a speaker. Most of the conferences I went to, I was a speaker there. I used to cold call the conference co-coordinators I bought directories of national conferences. Some speaking gigs were referrals. Anyway, I retired from speaking a few years ago. Added later; At a Dan Kennedy conference, I noticed Glenn W. Turner....master salesman and con man, now about 70 years old, wandering the halls. I recognized him from his old training tapes. I had a great in depth conversation with him. Gotta figure plenty psychic pets invite therapeutic massage. That is why I endeavor always to multitask sweet on precog smarts an' undeniable cuteness in the company of guys with neat-lookin' hands. That make me a kangaroo? Let there be bounciness Down Under. There's more than four there. Ok, ok l screwed up, but no more than someone in the past who got his numbers muddled up in a trivia thread, ahem. Wooster Mens Bathhouse and Massage Emporium of course. Parking meters, nope, gravestones nope, but there is a model airplane area next door. No chance, this forum offers him everything he needs, coffee, hot donuts, free subscription to the Wooster medical journal/Gun Enthusiasts Monthly a discount on Oral-Rectile-Creamex, for his,.....ummm,...well, he has a discount.